Mr. President. FORUM-ASIA welcomes the High Commissioner’s update on Sri Lanka. Incidents in the six months following the last resolution by this Council on Sri Lanka (A/HRC/25/1) strongly suggest that a climate of fear has been imposed within the country with the aim of preventing victims, witnesses and human rights defenders from voicing their concerns to human rights bodies outside the country, including UN bodies. Immediately prior to the resolution in March this year a countrywide wave of intimidation was accompanied by several arbitrary arrests including many in the North and the East of the country. Six months since then, this climate of fear has continued and has further been compounded by several recent attacks on human rights defenders by both state and non-state actors as well as media entities, this includes threats publicly made by government officials against those who wish to cooperate with the OHCHR Investigation on Sri Lanka (OSIL). The government has failed to investigate or take any effective action on any of these incidents while human rights defenders detained six months ago such as Ms. Jayakumari remain in detention. We recall here incidents cited in the joint letter by six international organisations to this Council on 25 August 2014 and in the High Commissioner’s update. FORUM-ASIA also echoes the High Commissioner’s concerns on the increased and persistent attacks against religious minorities including Muslims and Christians. Mr. President, the last three consecutive resolutions of this Council expressed significant concerns including: militarisation and land issues in the North and the East, the repression of the freedoms of expression, association and assembly; weakening of judicial independence and the rule of law; and the intimidation of and reprisals against human rights defenders, members of civil society, lawyers and journalists. In the last six months none of these issues have seen any improvement and many have seen further deterioration as noted in the High Commissioner’s update. Our concerns are further exacerbated by the Sri Lankan government’s public and open refusal to cooperate with the Council on implementing resolution 25/1 including by not cooperating with the OISL. Finally Mr. President, we call on the government of Sri Lanka to take immediate steps to fully comply with resolution 25/1 including by cooperating with OISL and remedy human rights concerns surrounding the country. 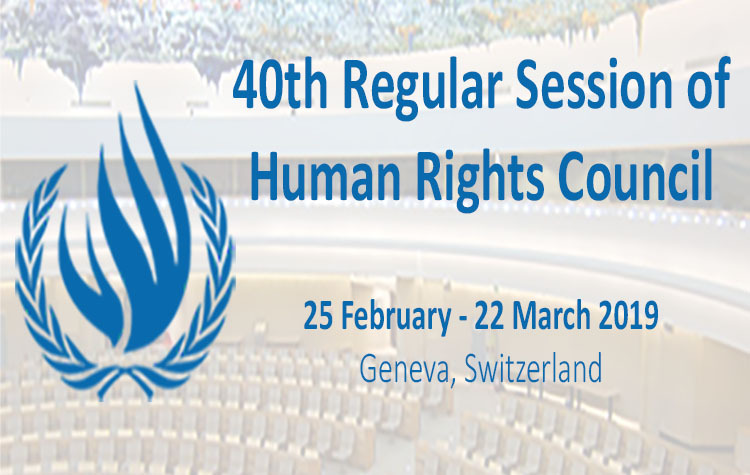 FORUM-ASIA further emphasises that given the dire state of human rights in the country it is of utmost importance to continue this Council’s attention on Sri Lanka. Thank You.